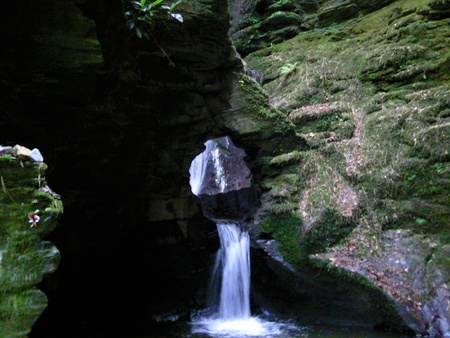 St Nectan's Glen has the most amazing and powerful waterfall and it's healing qualities are legendary. 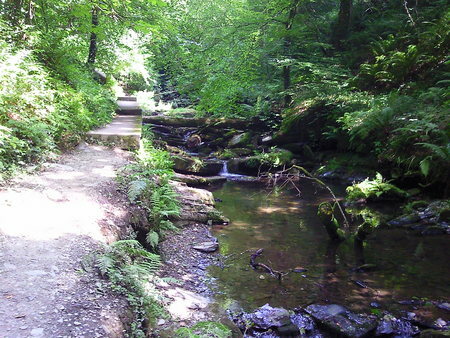 The walk through woodland that you must take to reach the 60ft waterfall takes you alongside a stream with many places to stop and take in the calming beauty of the water. 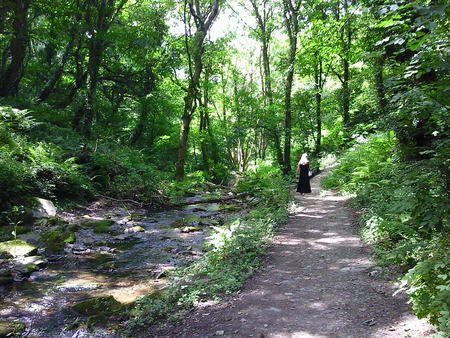 Here you will find images and videos taken during our visit there in July 2011.
just above the Waterfall and the Kieve (cornish for 'basin'), which bears his name. Unquestionably, a suitable spot for a holy man seeking seclusion! Tradition has it that behind the Chapel was a tower in which hung a silver bell which he rang, perhaps to warn sailors of submerged rocks on the treacherous cornish coast, or maybe to summon help from the Celtic monastery near Tintagel castle for vessels in distress (he would have been able to see both coast and castle from the top of his tower), or perhaps he rang it just to assure sailors that he was praying for their safety. As his end approached, the land was riven by the bitter differences between the older celtic and the newer roman faiths. He prophesied the return of the older, simpler faith and vowing that his bell should never ring for unbelievers, he carried it to the bank above the Kieve and dropped it into the basin. It is said that the submerged bell still tolls today. When St Nectan died, two strange ladies who are believed to have been his sisters came and, acting upon his wishes, they placed his body, the sacramental vessels and other treasures into an oak chest. They diverted the waters of the fall, dug a grave in the river bed below the Kieve and buried the chest. 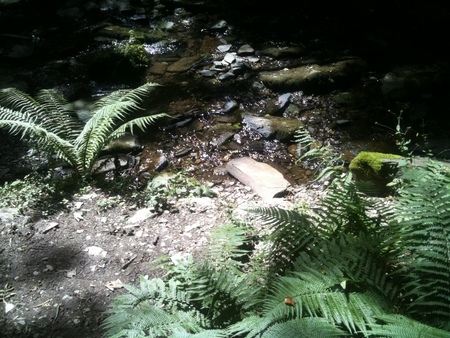 The river turned back to it's natural course and now flows over the Saint's grave. The beauty and the unusual formation of this 60ft waterfall are impressive. The Kieve, or basin, 20ft deep, is rounded smoothly like an immense sugar bowl, and the force of falling water has, over the ages, broken away the front. 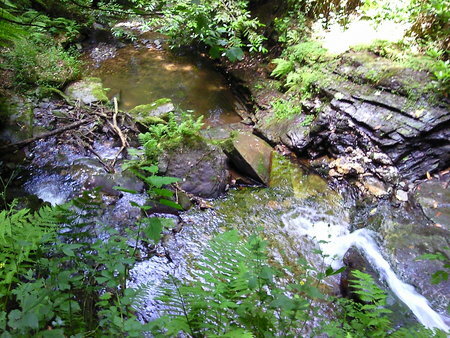 Above it, at different levels, can be traced the remains of at least three former basins, rounded out and broken away in front;and below the present basin where the water falls onto the rocks below a hollow is being formed today which, according to the experts, will be about the depth of a saucer in about 300 years time. Descending to the waterfall the visitor is treading the bed of an ancient watercourse fed by innumerable small streams, which once joined the main stream below the falls. Beneath the owner's living accommodation is the room which is reputed to be the site of St Nectan's Cell. Slate steps lead up to the chapel and the rear bedrock forms a natural stone altar. 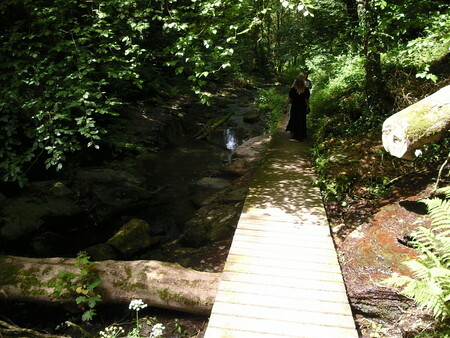 The owners are allowing access to this shrine which is the ideal place to meditate or simply sit and soak up the healing energies that flow through there. The site is held sacred by many and is always treated with respect and reverance by visitors from around the world. 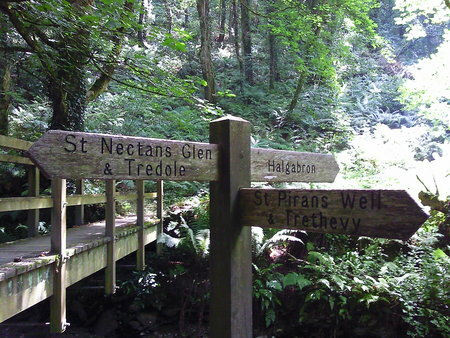 n.b: The above wording has been taken from the literature passed to us by Barry (the owner of St Nectan's Glen), who has given his permission for use on this site. Our visit to the Glen was made on a beautiful sunny day in July and is an experience that I will never forget. 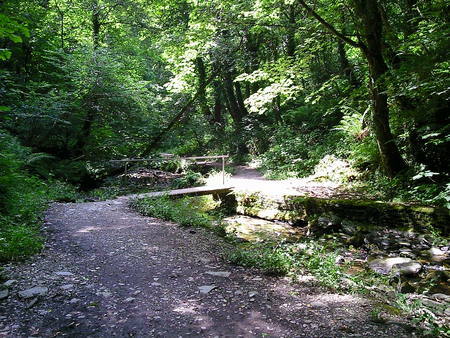 It's a long but relaxing walk from the car park to the waterfall and some of it is a steep climb but it is so worth it when you get there. And to chat with Barry over a (much needed) cup of tea in his tea gardens at the top of the waterfall was a real pleasure too!